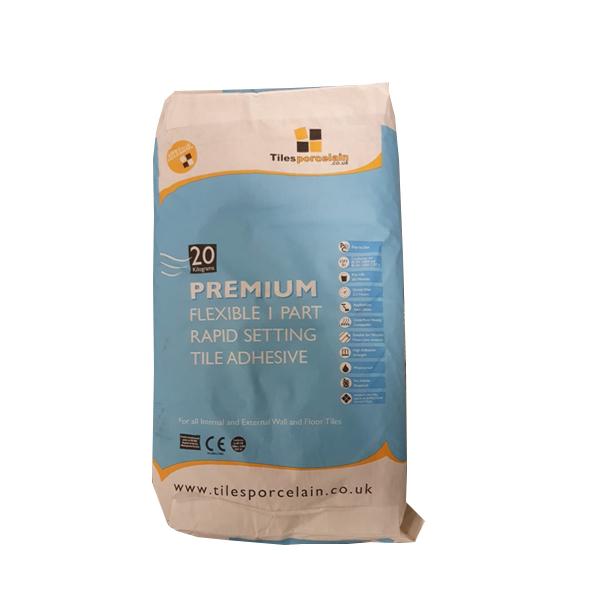 Our fast setting flexible adhesive is ideal for fixing wall and floor tiles in both interior and exterior areas. This easy to use adhesive offers premium quality fixing which complies with British and European standards. Before fixing, all surfaces must be clean, dry and strong enough to support the weight of the tiles and adhesive. The floor or wall to be tiled must be free from excessive or sudden movement and be securely fixed to the supports. If you are using underfloor heating then this must be embedded in a layer of adhesive and allowed to set prior to fixing tiles. This high strength adhesive is extremely easy to use. It is one part, which means no admix is required. You simply mix the adhesive with cold tap water to a smooth and creamy mixture, either by hand or with a slow mechanical mixing paddle. Mix only a sufficient amount which can be used within 40 minutes, then apply the adhesive to the floor using a notched trowel. The layer of adhesive should be between 3mm and 6mm when the tiles are applied. Also apply adhesive to the back of deep studded tiles to cover the studs. Ensure the adhesive is still moist when the tiles are pressed into place. Surplus adhesive should be cleaned as soon as possible from the tiles and joints. Once all the tiles are fixed, grout can be applied after three hours.